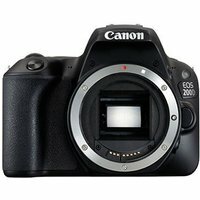 The Canon 200D is the latest generation of EOS camera, combining familiar touchscreen controls with superb image quality, an optical viewfinder and a portable design. The EOS 200D works hand-in-hand with your smartphone, for easy image sharing, and it records gorgeous Full HD video that looks as good on-line as it does on your home TV. A superb starter camera if youre new to DSLR.